Colonel Don M. Hoffman announced that Armed Forces Day for BHOD will be observed Sunday afternoon May 19 from 2:00 to 2:00 p.m. The activities of the day will be centered at the high school football field. A float, the theme of which will be "Power for Peace" will be on display. 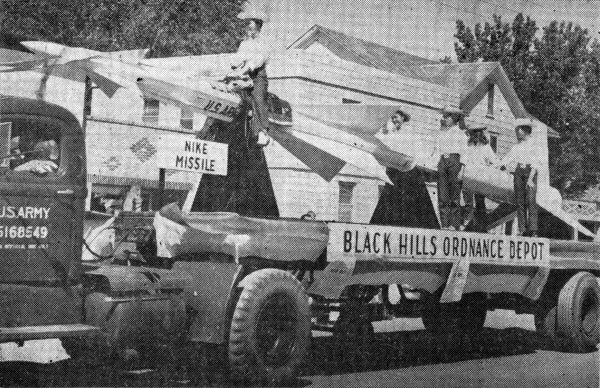 The same float is to be used the 18th of the month by the Rapid City Ellsworth Air Force Base in their parade when they observe Armed Forces day. 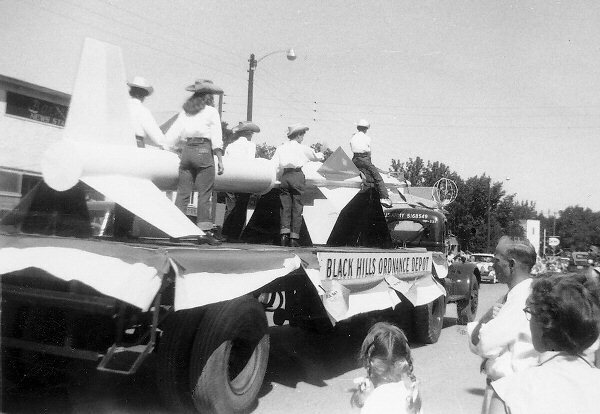 The float will display a model NIKE guided missile. The component parts of the NIKE were received from the Pueblo Ordnance Depot. 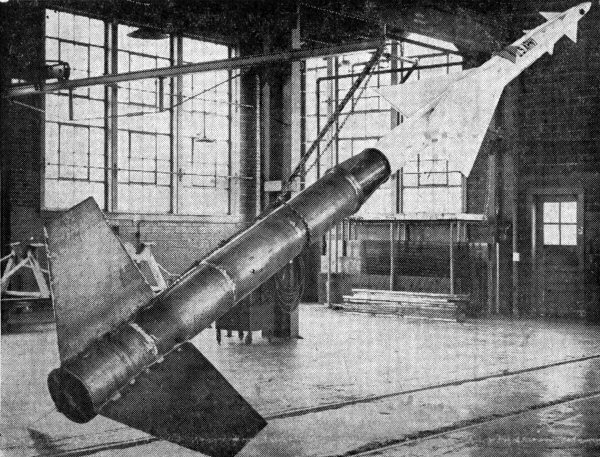 THE NIKE I MISSILE, a marvel of engineering skill and achievement, has three major components in its slender 21-foot long body. These are rocket motors to provide propulsion; a guidnace package to steer it to the target; and a lethal warhead to destroy the target at the interception point. These three major components will be found in any guided missile. In addition there is, of course, a launcher or mount from which the missile is fired. Actually, NIKE has two motors, one of which is a solid propellant booster to drive the missile off its launcher with tremendous acceleration. A few seconds later, after it has expended its fuel, the booster separates from the missile. The missile's self-contained liquid fuel sustainer rocket motor then takes over and provides enough propulsion force to maintain NIKE I's supersonic speed all the way to the point of target interception. The over-all length of NIKE with guiding fins is about 33 feet long. In Appreciation . . .
Special credit was well earned by Major Blette for his arrangements for the Nike display, and to Mr. Bohart and his crew for the splendid work of putting the Nike together and mounting it. Praise is due Del Harbaugh and Ed Eissler for the actual fabrication of part of the missile. This display was the highlight of the Rapid City parade, and afforded BHOD some very nice publicity. Mr. McClurg of Surveillance was the expert speiler on this display. The train ride, with Engineer Dale Coen at the throttle and Conductor Ed Eissler on the air line was a unique and enjoyable part of the program. The overflow of passengers was well taken care of by the buses provided by Mr. Bohart and his motor pool. and High school Pupils won first place in civic floats at the Fall River County Fair at Edgemont. Pearl Ann Robb, Patty Jo Plumb and Jean Grubbs. Driver of the float was Harry Lehman.